Sometimes the heart loves hating and sometimes the heart hates loving, but more than anything, the heart just wants to feel. The past couple of weeks have involved numerous road trips, which meant long hours in the car, on interstates that seem to go on forever and favorite songs on the car player that eventually became background noise. Driving always makes me think. For some reason, I get lost in my own thoughts and they wander. My drive home after spending a couple of days in Washington D.C. was exhausting. The bitter cold didn’t help and the fact that I was missing home and Mark made it worse. But there was always something so comforting about stepping through my front door and into his arms. It’s all I could think about as I drove across state lines and past every exit and some days I still wonder how we wound up here. I caught myself thinking about it out loud as we were waiting on a couple of friends to head out for dinner last night. At one point, I glanced to look at Mark who was right beside me, took a deep breath and contently accepted that this was my life now. Sometimes it is so easy for me to cower away and doubt all that we share. Sometimes I beg for honest conversations with him, wanting to hear him tell me me that love can be concrete and not flailing only because I’ve never had the privilege of experiencing something as beautiful as this. I remember falling asleep on the couch that Friday night while he stayed up watching movies on Netflix. Every so often, I’d awake only to sleepily catch him watching me. It surprised me. I think it still scares me to the core to be in love and to love somebody like this. Meeting my best friend from home who bravely battled the cold in the Northeast just to spend some time with me was exciting. One, we haven’t seen each other in nearly three years and if anybody knows anything living abroad, you’d agree that trying to keep in touch all the time is sometimes easier said than done. But getting the chance to see her and catch up was nice. It felt as if no time has passed but we’ve both grown up a little bit more. She was thoughtful enough to bring me some snacks from home and I was elated. We drank wine, exchanged stories and gave each other advice. Watching her cross the doors into the airport at the terminal made me wish I was the one going home for once. Just for a little while. So while I am still homesick, I naturally gravitate towards anything that would come close to remind me of home and one of my favorite things from home is the abundance and variety of noodles. 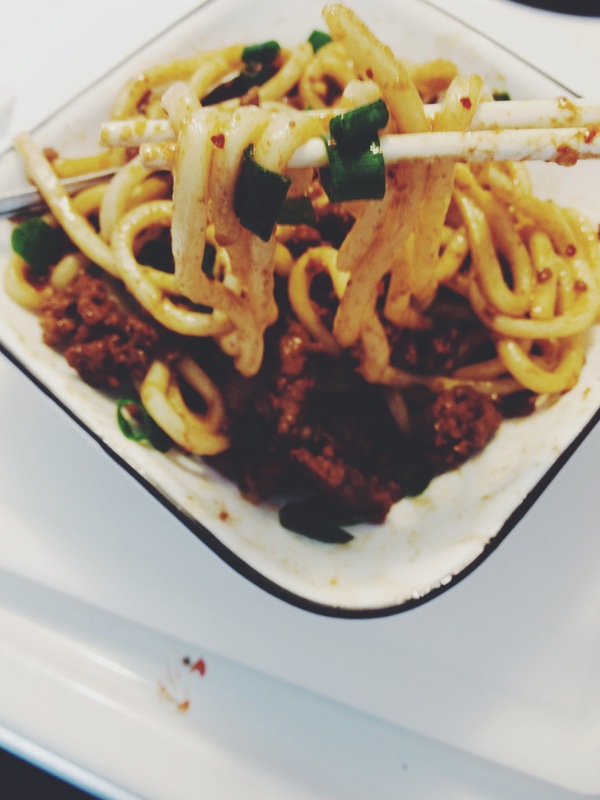 Even if you didn’t like noodles, you would end up finding something you like. 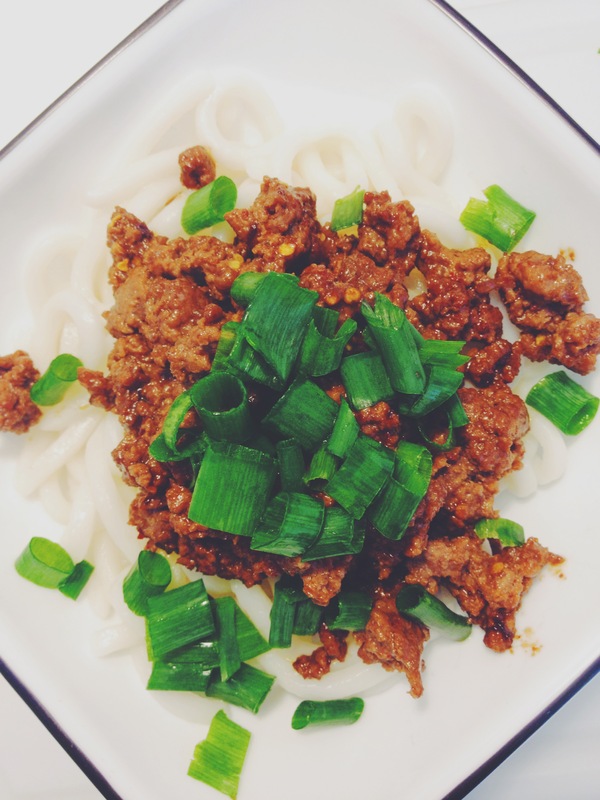 I made this super easy meat sauce with green onions and udon noodles a couple of weeks ago. It’s so yummy, I think I could eat it every day. If you have vegetables like zucchini, cucumbers, carrots or anything at all lying around, feel free to add to it for texture and color. I think I’m about to go make some right now! Brown meat in a pan and drain grease. Add sauces to pan and mix well. Add a little bit of water if you want a saucier consistency. 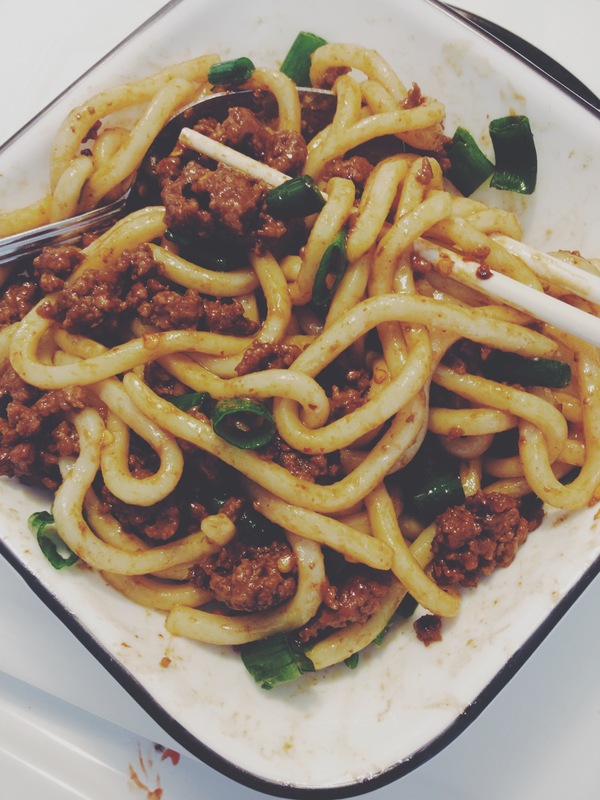 Pour sauce over cooked noodles and garnish with chopped green onions. Mix noodles with noodles until even coated. Mark came home at about 10 a.m. the next day. The morning’s weather was dreary. Rain dropped steadily outside my bedroom as I rolled over to fill the empty spot beside me. I was so glad he had decided to come home. I woke up, brushed my teeth, tidied the room a little and rolled back under the covers to wait for him. He was in the exact same jacket and shirt despite bringing a change of clothes with him when he left. “I’m sorry…,” he whispered and I couldn’t help but well up with tears again. Our “first fight” had undeniably left us both exhausted. I had spent hours on Skype with my mom the night before, seeking for advice and solace, and she gave me enough to finally fall asleep for a couple of hours. Mark crawled in beside me that morning, which felt like routine. Comfortable routine that I’ve sometimes taken for granted, especially in the past couple of months. He gave me the opportunity for some answers and I gave him the chance for apologies while offering some on my part too. I realized that the road to our lives together had only just begun. Fights are inevitable and the best I can do is to take each one as they come, reconcile and hopefully always remember the love that we have for each other. Winter has decided to kick in here in Eastern North Carolina so Mark and I are always on the couch by each other facing the tv. Yesterday he felt so comfortable being in his uniform that he didn’t change out of it until it was time for bed. He called it being “ultimately lazy”. We spent the majority of the day cleaning the house after our small holiday stint with my brother, who was visiting for a couple of weeks from Minneapolis. Dishes piled up so quickly and pine needles were all over our living room floor after tending to our first real Christmas tree. Mark figured out how to work a hand-me-down vacuum while I scrubbed some toilets and wiped a lot of counters down. Mark is a huge fan of red meat. Me, not so much. I like my white meat. But we recently did some grocery shopping and found a good deal on flank steak, which I thought would be great for stir-frying. 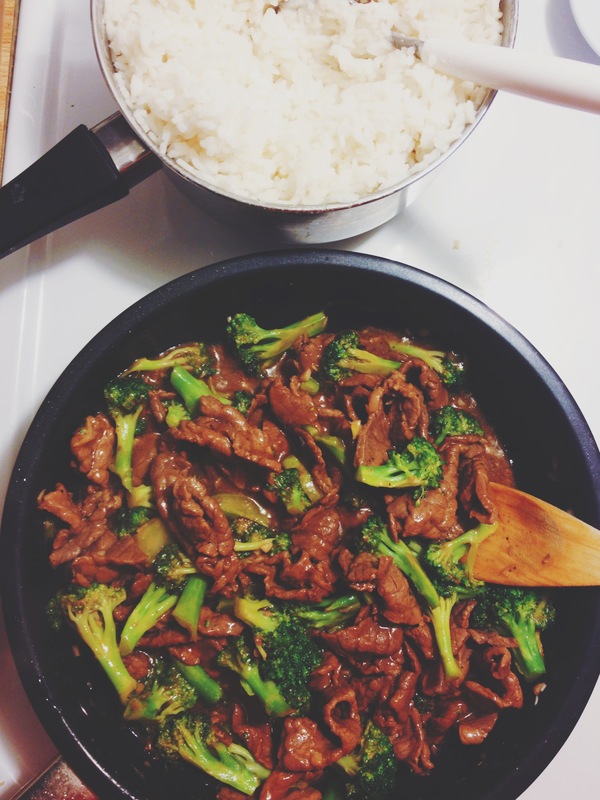 Dinner tonight was stir-fried beef and broccoli, which I think is an American favorite when it comes to Chinese food and takeouts. Honestly, Chinese cooking here is almost as foreign to me as American cooking just because ingredients are so different so dinner can be quite an adventure. I got two thumbs up for making dinner tonight though and couldn’t be happier because it was so easy. Mark was happy that I made white rice instead of brown (I figured I’d indulge) and seized the chance to sprinkle half his serving of rice with white sugar. Apparently, it’s one of his childhood favorites. Either way, we were stuffed, leaving more than enough for leftovers that I or him will be finishing in no time. Marinade steak with soy sauce and corn starch in a baggy and let it rest in room temperature for 10 to 15 minutes. Stir together sauce ingredients, dissolve corn starch in water separately and set aside. 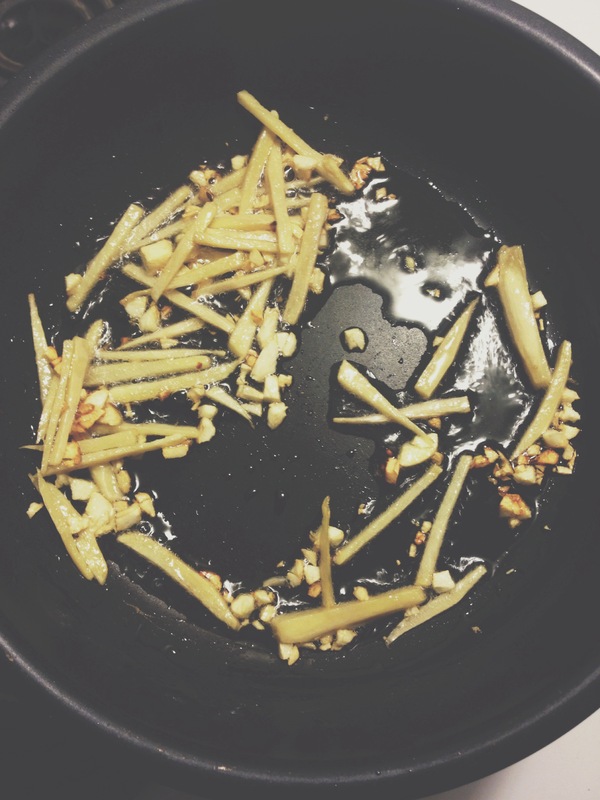 On medium-high, heat oil in wok or pan. Plan marinated beef in oil in a single layer and wait for side to cook, about 1 to 2 minutes. Add garlic and stir evenly. Add broccoli and sauce mixture to the pan. Stir all the ingredients until sauce coats most of the broccoli florets. 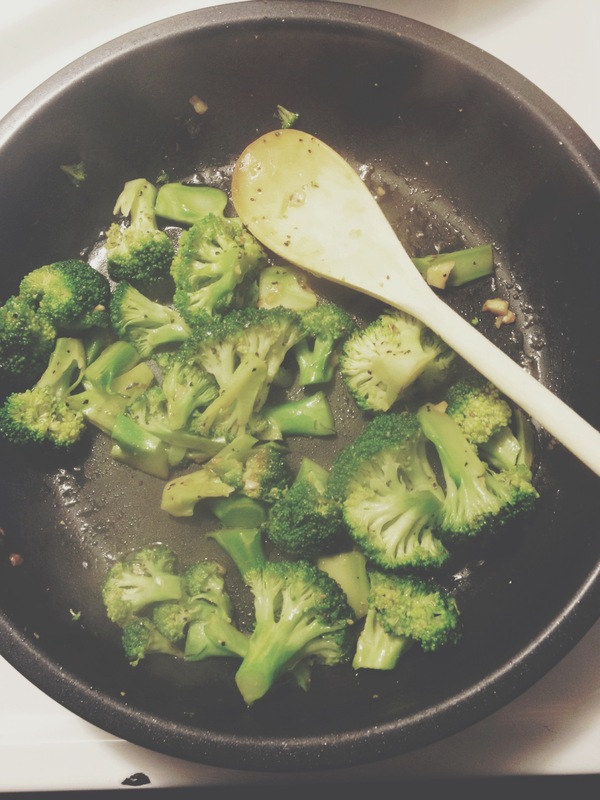 Close the pan with a lid and allow steam to cook the broccoli until tender, about 2 minutes. Add dissolved corn starch and stir until sauce thickens and meat is well-done. Serve with steamed rice or fried noodles. What’s your favorite kind of leftover meal? Rain and clouds never fail to make me extra lazy. I didn’t manage to get anything done until Mark got home at about 4 in the afternoon yesterday because I was tucked snugly under the blanket on my couch. It’s my first autumn/winter in North Carolina and I’m mildly surprised at how warm the weather still is in November. We had a short shower yesterday, which brought temperatures down into the mid-60s and me under the blanket, on the couch. Gloomy days also has this way of making me miss home, so I decided I’d whip up a quick dinner that never fails to remind me of home. I also got Mark to eat an entire serving of choy sum this week; a type of Chinese cabbage found in many popular dishes back home — a staple when I was growing up. 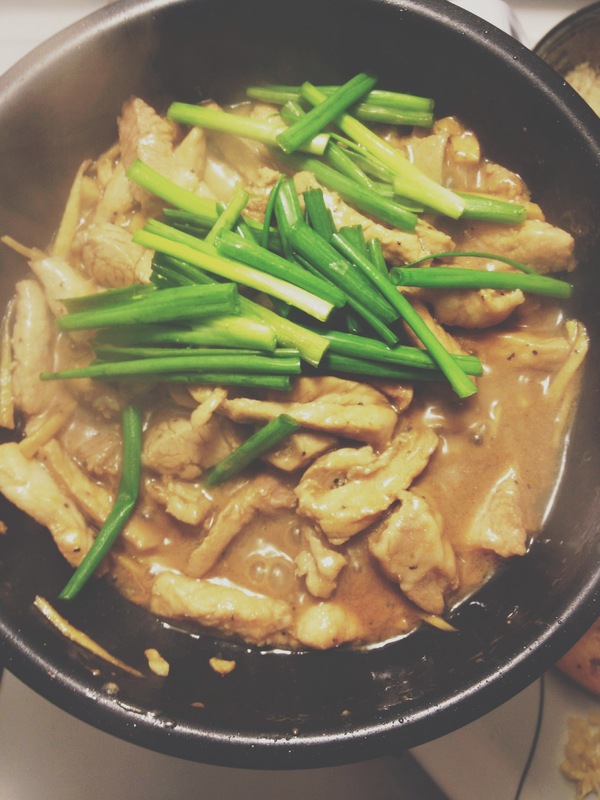 What reminds me most of home and family often is my mom’s simple home-cooked meals. Her soy ginger pork stir-fry is one that’s incredibly easy yet delicious at the same time. I used some leftover pork chops and marinaded them in soy and oyster sauce and some fresh cracked pepper plus salt to taste. Ginger is also common in a lot of Chinese cooking. Growing up, my grandma and mom would say that its pungent and slightly bitter heat is good for keeping warmth in the body. Adding some Chinese rice wine, this dish is often served to women after childbirth with the belief that it will help nourish and heal the body after labor. I brown the ginger with garlic in a pan to start and the smell in my kitchen is divine. Towards the end of cooking, I like to throw in a handful of chopped scallions just for color and a little bit of crunch. 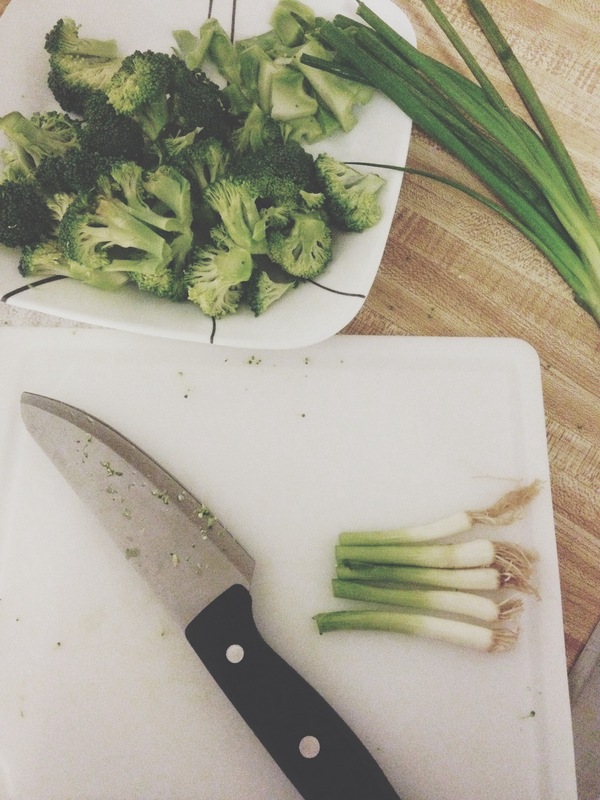 I love scallions, or green or spring onions, as some would call it. I’d put it in everything if I could! Here’s a cool trick I learned. When using scallions, save the ends where the little roots grow (as pictured above) and submerge them in a glass or jar filled with water. Place them on a sunny window and the onions will start to grow, meaning you get to use them again! And again. Anddd again. Rinse the root out about once or twice a week and replace with fresh water. This should help you save at least 50 cents from the grocery store. 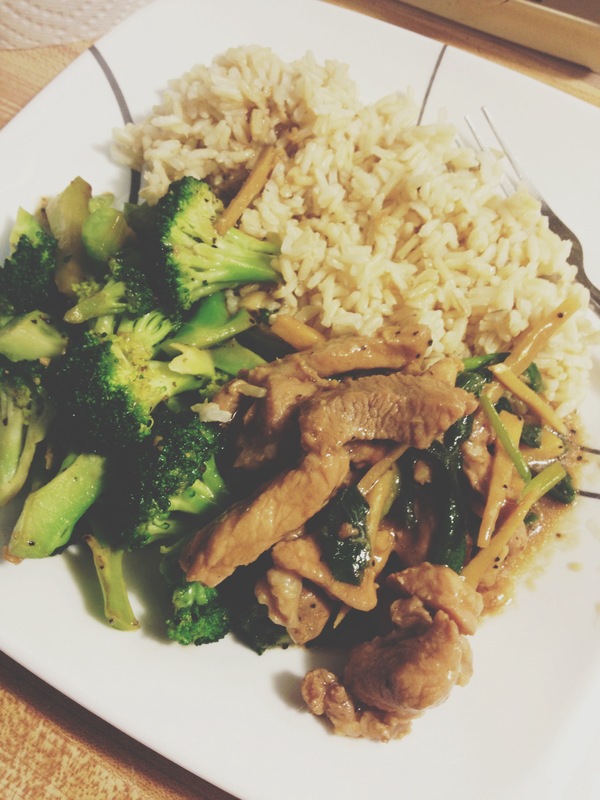 Last night I also wanted a good serving of veggies with my dinner so I stir-fried some broccoli with garlic and oyster sauce and made a cup of brown rice as sides for both Mark and I. Needless to say, I went back for seconds. I think mom would be quite proud that I’m finally able to prepare some of her simple dishes and hopefully, she’ll pass more recipes to me as I grow older. 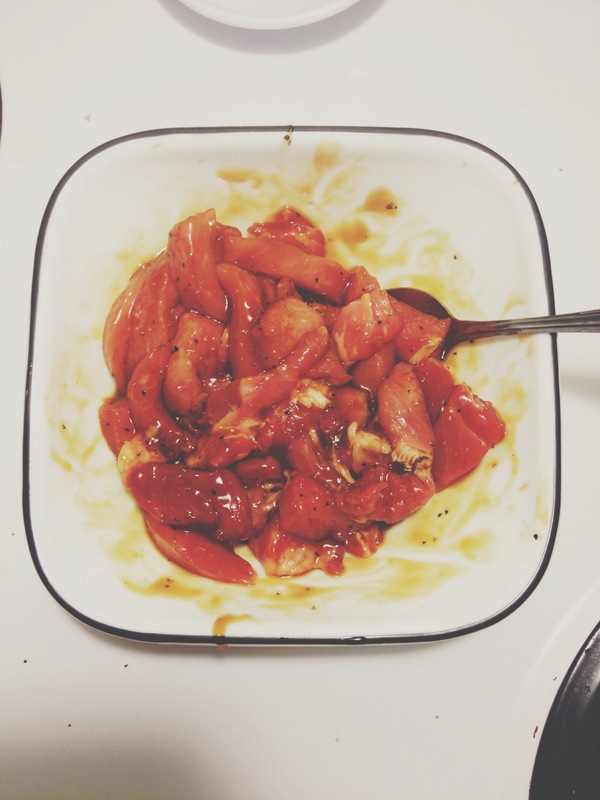 Add ingredients from marinade into a bowl and mix well. Stir in pork slices and mix until evenly coated. Set aside for about 15 to 20 minutes. Using a medium to high heat, heat pan or work with vegetable oil. Brown garlic. Be careful to watch as it browns (sometimes burns) quickly. 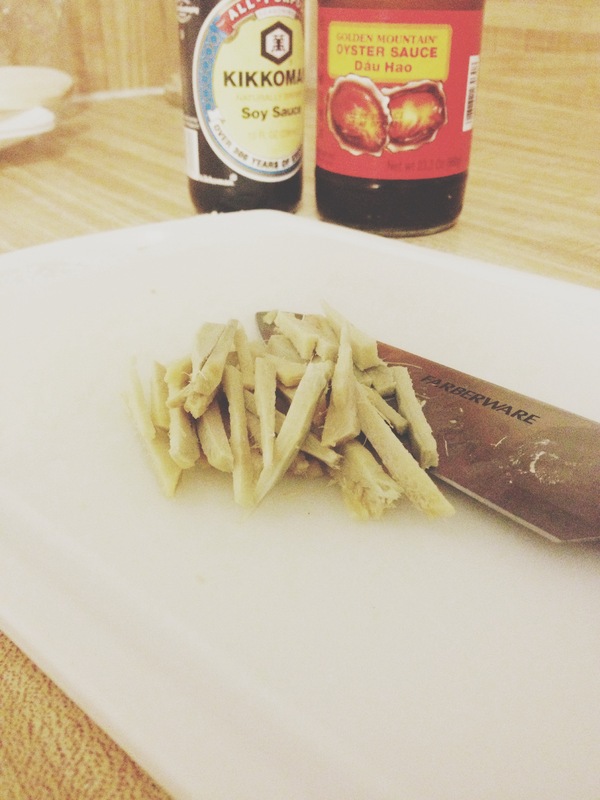 Add ginger and fry until fragrant. Then, stir in the pork marinade and cook for about 10 minutes or until it is almost done. Add water to help scrape the pan and giving the dish its luscious sauce. You can always add more water if you want it saucier. Reduce heat and let simmer for about 5 to 7 minutes, until pork is done and tender. Toss in scallions and a little bit more salt and pepper to taste. Serve with steamed rice. What’s your favorite hand-me-down recipe?